Add a redirect tag as shown below to the button code generated by dap. Please see: http://www.digitalaccesspass.com/doc/aweber-integration/ For paid products, always integrate DAP -> Aweber. For free products, you can use either aweber webform -> DAP OR DAP direct signup form -> aweber. Create a free product in DAP. Use Aweber webform -> DAP to integrate aweber free list to DAP free product. When the users signup using the aweber free form, they will also be signed up in DAP. Encourage these users to update their paypal email address in their DAP userprofile after they become member that way when they become paid members (applies to payment via Paypal only), DAP will add the paid product under the same user account under which they had free product. Create the paid product in DAP. Integrate DAP with the payment processor so when they purchase the product, DAP will be notified and the user account will be created in DAP. Update the 3rd party notification field in DAP products page to notify the paid aweber list. Add product chaining rule in DAP to remove access from free product when the user gets access to the paid product. Add rule in aWeber to automatically remove user from free list when they get added to paid list. When the user makes purchase, DAP will add the new product to their existing account, remove free product from their account, add them to the new aweber list and aweber will remove them from the free list. >> 5. There are two subscription products: Monthly ($10, recurring) and Annual ($100, Recurring). A subscriber tries Monthly for two month and then decides to “upgrade” to an Annual subscription, which is cheaper in the long-run. Is there a way to automate this for the subscriber’s choice? Setup product chaining rule in dap to automatically remove user’s access to monthly product if they subscribe to annual. They will get 30 days access initially. When the next payment comes in at the end of the month, dap will extend access by another 30 days. 2) now after the user purchases monthly product, they want to upgrade to annual payment option. They will click on the buy button to complete purchasing the annual subscription. DAP will now give them access to the annual product with a start date of current date and end date of 365 days from today. The product chaining rule will trigger and dap will remove this user’s access to monthly product. So now in manage users page, you will see the user is tied to annual product and not the monthly product. You do need to take some manual action in this scenario. You will have to login to the payment gateway (authnet or paypal) and remove the users old subscription to monthly). DAP will not automatically remove user’s monthly subscription profile in the payment gateway. >>6. How do i make sure the email drip feed via DAP autoresponders are working? Then check the user’s email box at the top of the hour to see if the day-1 drip emails went out. If the user is on say day 2 of membership… then they will receive the day 2 drip emails at midnight (server time) because when the cron runs for the first time for that day (at midnight), it will pick up all users that are on day 2 of their membership and send out day 2 emails. NOTE: This content is for advanced users only, who understand the concept of user tables, database, etc. If you don’t understand any of this, then just ignore this – you don’t really need to know this in order to use DAP. This is only an explanation for those who wish to go under the hood of DAP and its integration with WordPress. As you probably already know, WordPress has its own user database. 2) More powerful user search, profile updates, affiliate information, etc. So, if you want to use any WordPress based plugins – like WordPress Forums or Subscribe2Blog – these forums are looking at WordPress’ native user database. Now comes the necessity of “syncing” the DAP user data and your WordPress user data. In the DAP Dashboard, in “Setup > Config > Advanced“, you will see two settings for syncing DAP & WP user data. If you turn this to “Y” (for “Yes”), then every time someone logs into DAP, their DAP user data (just name and email) is automatically “synced” with WordPress user data. If you set this to “N”, then no data will be transferred from DAP to WordPress. If you want only your “PAID” members to be synced with WordPress, then set this to “Y“. If you want both “FREE” and “PAID” members synced with WordPress, then set this to “N“. After you save the above two config settings, make sure you log out of DAP and re-log in (if you are/were logged in and testing as a regular user), because only then, the Config settings above will take effect. Your user must log in through a DAP login form (not the WP login form). 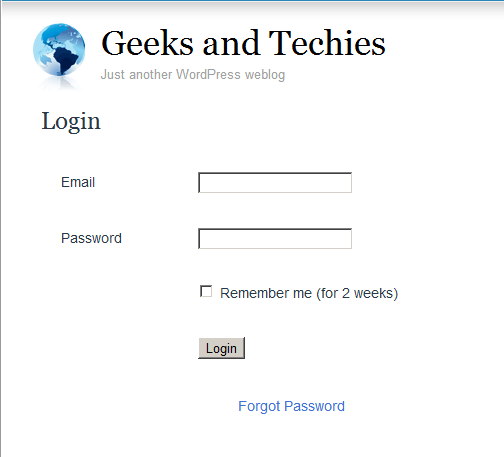 Make sure the user is redirected to any part of your WordPress blog after log in. This can be done via “Logged In URL” setting in DAP Config. The user can be redirected to any WP page, WP post or even your blog home page – that’s the only time the ‘syncing’ kicks in. When user lands on any page/post of your WP blog, then the DAP LiveLinks plugin (which you have already installed & enabled) kicks of the “sync”, copies the logged in member’s name and email over to the WordPress user table, and also automatically logs him into your WordPress blog. DAP has a Login/Logout Widget that you can use in any widget-ready theme. Log in as WP admin, and look under “Appearance > Widgets”. You’ll see the widget. Drag this widget on to any customizable part of your theme. The widget puts the DAP login form right on your sidebar. When a user is not logged in, they will see the login form. When they are logged in, they just see a “Logout” button. How do I protect a blog post? It will now show up on the right-hand side of the box. Click on “Edit” next to each link to configure dripping. How do I protect a file? Use the “File Browser” on the “Products/Lists” page to browse through a folder on your web site, and next to each file, you will see an “Add” link. Clicking on that link will add that file to the product. I have protected a blog post. But I can still view it without logging in. 1. Are you already logged in a a user who has access to that link? Maybe logged in as DAP Admin, and that is why you are able to access the link? If so, either log out of DAP, or visit your blog in a completely new browser (if you’re logged in as DAP Admin in FireFox, then visit your blog using Internet Explorer). 2. After you set up DAP, did you visit the “Permalinks” section and click on the “Save” button at least once (even if you didn’t make any changes to your permalinks structure)? 3. Have you added the blog post to a Product? If you don’t add it to a DAP Product, the post or file won’t be protected. Can I protect an entire category of posts at one go? See Protecting An Entire WordPress Category. Make sure you have “Sneak-Peek” turned off in the DAP Admin Config section. Once you do that, posts that are protected will not be displayed on the home page as well as if someone tried to visit the link directly. When I try to browse through the files on my server, on the Products page, I get a popup error msg that says ‘There was an error returning data”. When adding Folder name ‘To Protect Files’ option the js loader keeps on loading. Answer: Those are all symptoms of the same issue: Too many files to load in the little “file browser” section, and DAP is timing out. Visit the link to make sure that there is no typo in the URL, and make sure that the file is there for download (you’ll see the “Download or Save as” popup). Then simply paste that URL into the Add URL field and protect it.